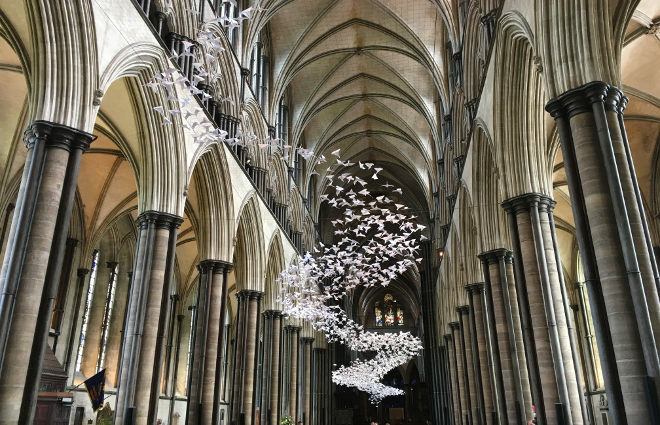 During a recent visit to Salisbury I made a special stop at the cathedral to see this beautiful exhibit by artist Michael Pendry, titled Les Colomes. It features more than 2,500 paper doves flocking in the cathedral nave. The sculpture inspired a spectacular community project. Beyond the cathedral, paper doves flutter in windows across Salisbury, depicting the locals’ refusal to succumb to fear, following the chemical attack in the city last March, which poisoned former Russian spy Sergei Scribal and his daughter and Yulia. Imagine a peaceful town becoming the epicentre of some kind of attack. How might the townspeople decide to show their resilience?